One of the most surprising abilities mankind will ever know. Has been born into the eyes of a six-year-old girl. For one very special reason. To see what we cannot. An evil that we cannot comprehend. Or even see. Preparing to destroy everything, using mankind's greatest weakness. But we have a secret. A little girl named Sarah. Afraid and alone. And under the care of a young, inexperienced social worker. A young woman willing to sacrifice anything to keep Sarah alive. Because if Sarah fails. We all do. "Awesome storyline!! - Loved this book from start to finish. The story is compelling and keeps you on your toes! Had the perfect mix of action, suspense and a wonderful message!" "A delightful read, couldn't put it down - I recommend this book thoroughly, the premise is outstanding. The pace is perfect and the twists and turns come at breakneck speeds. You will not be disappointed!" "If you did like DaVinci Code, you're probably going to love Amid the Shadows." They were being followed again. He could feel it. The man squeezed his son’s hand and quickened their pace. He pulled his coat tighter, feeling the cold morning chill penetrate through his thick wool coat. Above them, the rising sun was obscured behind the thick layer of smoke from the sea of chimneys dotting the horizon. The man looked over his shoulder and spotted the large figure behind them. He was getting closer. This was not the first time Dean Kelly had been threatened. His success as one of New York’s largest merchants had made him and his family a common target by those less fortunate. This time was different though. Whoever this person was, he had been following Kelly and his son for some time and always watching them from a distance. Behind Kelly, the dark figure quickened his pace as well and began to close in. He could feel his heart rate increasing rapidly, and his hands were beginning to shake. It was growing nearer. He kept his head down and mostly hidden beneath his coat’s large collar. As he drew closer, his eyes narrowed. He splashed through a deep puddle without slowing. Fifth Avenue was busy with people walking back and forth, all trying to avoid the water-filled potholes in the dirt road. A large, horse drawn carriage passed unnoticed as the man’s vision and hearing began to tunnel and zoom in on the Kellys ahead of him. What Dean Kelly did not know, however, was that it was not Kelly in whom he was interested. It was his young, eight-year-old son. Kelly and his son walked faster. He knew the man behind them was getting closer. They neared a large construction site where dozens of men worked in the drizzling rain, shaping large stones for the foundation of a building behind them. The ringing of their metal chisels could be heard far down the busy road. As they neared, one of the large men put down his tools and stood up. He spotted Kelly approaching by his dark hair combed straight back and, after locking eyes with him, Kelly gave a firm nod. The large workman put his hands inside his overalls and nodded back. He then turned and motioned to several men behind him, who all stopped and followed, heading for the road. The shaking intensified as the figure was now within fifty feet of Kelly and his son. It was going to happen. It was time. He could feel his body flushing with adrenaline. The stranger pushed past him without a word but was stopped by the workman’s hand around his arm. The figure looked to each side then back to Kelly and his son. His crystal blue eyes widened as they began to move away from him. He pulled his arms free and tried to run, but was caught again. This time by more men who crowded around him, grabbing his coat firmly. “We can’t have that now.” Without warning, the workman to his right slammed a fist into his stomach, causing him to lurch forward. But the stranger still barely acknowledged them. He quickly rose to his feet and surged forward, pulling the other men with him. His blue eyes now began to show signs of panic. The other men were surprised by his strength and delivered two crushing blows to his back and kidneys. The stranger fell again, this time onto a knee. The shaking in his hands became almost uncontrollable. He abruptly looked away from the boy and turned to the men around him. When he stood up, he did so with incredible strength, pushing the surprised men back in an instant. When they tried to grab him again, their hands now met a much greater force. The figure seized one of the arms around him and snapped it at the elbow, causing a large man behind him to scream out in pain. The others instantly jumped on the stranger, beating him savagely, but this time he did not fall, or even kneel. Instead, his body moved like a whip, spinning and kicking the largest man square in the chest, lifting him off the ground and sending him crashing into a nearby wheelbarrow. The stranger’s arm lashed back and forth, almost too quickly to see. He struck one man in front, and another behind him, in nearly the same instant. Both men stumbled backwards with blood streaming down their faces. Dozens more workmen were suddenly upon him as others fell to the ground. The figure in black spun again and two more men collapsed to the dirt beneath them, one unconscious and the other slowly dying from his smashed throat. In a fury, Kelly’s men crowded around. Their constant blows raining down on the stranger, but with little effect. Many of the strikes were blocked, or missed entirely, as the man in the middle seemed to move faster and faster. Flashes of metal were seen as long weapons appeared from under his thick black coat. They instantly found their targets and two more workers collapsed. Another shrieked blindly feeling for his eyes. Finally, one of Kelly’s largest men launched himself at the figure in the middle and struck him hard with a large heavy leather sap. The stranger reeled back, dazed, trying to find the weapon. Another sap was quickly pulled and slammed against his head. Then another, and another. The stranger’s vision began to blur, yet he continued taking his attackers down, one at a time. But the saps continued to find their mark. He stumbled and managed to grab one of the weapons, striking the sap’s owner with it harder than any of them would have imagined. The man was killed instantly. More blows caused the stranger’s vision to darken. He could barely make out Kelly and the boy in the distance. He desperately tried to push out of the circle and run after them. Just as he finally managed to get through the group of men, a gunshot rang out. He lurched sideways as the bullet ripped into his side. A second shot immediately pierced his thigh, destroying a lateral wall of muscle and causing the stranger to fall onto his left side. His entire body was shaking now as his eyes desperately searched past his attackers for Kelly and the boy. He pushed himself up onto his right leg and managed to hobble two small steps forward when the next bullet dug into his back, toppling his body forward, onto his chest. Kelly pulled his son, Ryan, forward. He tried to keep him from looking back at the commotion, but when the shots were heard, the boy pulled away and turned back to look. He saw the strange man fall to the ground, his piercing eyes finding the boy and staring straight at him. Their eyes locked for a moment as the man continued crawling forward with his hand outstretched toward Ryan. Frightened, the boy suddenly stumbled backward over a large stone. He slipped beyond the grip of his father, falling backwards into the crossroad behind them. “Ryan!” Kelly yelled, and reached for his son just as several passing horses snorted. The boy fell directly into their path and was trampled beneath them. Seeing the boy trampled, the stranger, still trying to drag himself forward on the ground, let out a gut wrenching howl. His entire body convulsed and his eyes rolled up into their sockets. The eerie howling continued until the final blow to his head, and his body collapsed into the thick mud. Saint Patrick’s Cathedral was one of the largest and oldest in the entire city. Able to accommodate over twenty two hundred people, its decorated Neo-Gothic spires towered three hundred and thirty feet above the street below. Inside, the Pietà, sculpted by William Ordway Partridge, was three times the size of Michelangelo’s Pietà, and the cathedral’s combined organs numbered over nine thousand eight hundred pipes. It was also the seat of the archbishop of the Roman Catholic Archdiocese of New York. The cathedral was a national historic landmark and a popular tourist attraction, bringing tens of thousands of visitors every year. The architecture was so impressive that few could resist taking a picture on the steps of its giant entrance and, with the warm spring weather, today was no exception. Hundreds of visitors milled in and out of the cathedral, setting off a continual stream of flashes from their digital cameras, then visiting the gift shop on their way out to take home a souvenir and a piece of the city’s history. Across the street, hundreds more stood back to snap pictures of the entire structure. Outside a nearby café, people dined on a late morning snack of scones and coffee while enjoying the view. At one of the outermost tables sat a man in a suit, taking in the scene. His hair peppered with small amounts of gray, he looked more like a local businessman than a tourist. Sitting calmly with his hand wrapped around a cup of coffee, he watched the mass of people entering and exiting the church. A young, attractive barista with round glasses approached with a hot pot. Seeing his cup was still untouched, she continued on to the other customers. She thought it odd that he had been sitting there for almost an hour and not even taken a sip. She gave him a curious glance before heading back inside. A newlywed couple giggled and ran past the man’s table. The young husband pulled his bride in for a quick kiss before they turned and trotted across the street, holding hands. The newlyweds were soon followed by a small group of Japanese tourists who crossed to the other side where they stopped and took pictures of each other, beaming in front of the church. The man looked down at his Rolex and calmly looked back up to the cathedral. He did not want to miss this. At five minutes past eleven, the bombs went off. A deafening explosion could be heard from within the church, and smoke burst through the giant front doors. Everyone screamed and started to run when part of the ceiling began to collapse. Huge sections of the beautiful stained glass windows broke apart and fell onto the people below. The force of the collapsing roof pulled the west wall inward and down upon itself. The screams were muted by a thunder emanating from the cathedral’s enormous spires. One began to move, wobbling from side to side until cracks appeared. It too collapsed downward, pitching at its base, and causing it to lean and smash into the second spire. Together, they came down in a deadly heap of smoke, dust, and rubble. People came streaming out of the café in horror, including the barista. No one noticed the well-dressed man stand up and walk to the corner. There, he continued to watch the carnage as people ran screaming in all directions. Many of them bloodied, and covered in dirt and ash. Moments later sirens could be heard in the distance. The man took one last look and began to turn away when something caught his eye. He looked back to the smoldering building where, among the confusion, a mother was whisking her young daughter away to safety. She ran, pulling her daughter behind her. However, the girl was not looking at her mother, nor the terrible scene behind her. The young girl was looking across the street and directly at him. He watched her for a long moment as the girl continued staring at him. Suddenly feeling uneasy, the man turned and walked quickly down the street, disappearing into the chaos. Detectives Danny Griffin and Mike Buckley pulled their sedan into the parking lot of the Marriott Hotel. Several patrol cars were already there and an ambulance was parked near the main entrance. After getting out and slamming the car doors behind them, both men approached the area near the ambulance that had been cordoned off with yellow tape. As they passed an officer holding back a group of onlookers, Griffin looked up and counted the floors to the broken window; eight floors. They reached two more officers in blue standing over the coroner, who was kneeling down and examining the body. “Jumper?” Buckley asked, looking down. Griffin nodded and looked around. He and Buckley scanned the group of onlookers for anyone who might be watching the crime scene with a little too much interest. They backed up and surveyed the area, noting the basics: the glass, the distance from the building, and the position of the body. A few minutes later, they entered the hotel and headed for the elevators. Cheryl Roberts was the lead investigating officer on duty. At five foot six with dark, shoulder-length brown hair, Roberts was known for being all business. She greeted Griffin and Buckley with a nod when they entered. Several other investigators were moving around the room, taking measurements and pictures. The detectives looked around the room and walked toward Roberts, who had just finished with another officer. Virtually everything in the room was either broken or completely destroyed. “What do we have?” Buckley asked, stepping over some broken glass and a large piece of a picture frame. Another officer stuck his head around the corner. “Hey, you guys are gonna want to see this.” He motioned down the short hallway and all three followed him into the bedroom. He crossed the room to a large dresser and pointed to one of the lower drawers, which was open. Inside were several pieces of clothing, neatly folded. “Jesus Christ,” said Roberts, looking around the room. “Search these rooms!” She got down on the floor and looked under the bed. They all quickly searched every nook of the small rooms, but found nothing. Griffin watched Roberts’ focus sharpen. She was a great investigator, but she was also a mother; and there was no greater instinct than that of a mother regarding a child. Griffin could see her beginning to get angry. Roberts instructed everyone in the room, except Griffin and Buckley, to drop everything and search first the floor then the entire hotel. She also had the hotel’s security team checking all footage from the cameras. A kidnapping was a different priority to cops. A kidnapping meant there was still hope. Suddenly, one of the investigators burst into the room. “Come quick!” He disappeared back out into the 8th floor hallway with the others running after him. They ran down to the end of the hallway where a laundry cart sat next to one of the doors and another officer was waiting. They all came to a stop and looked at him expectantly. The officer calmly motioned toward an oversized cloth laundry bag. At the bottom sat a small blond girl, looking up, and scared to death. "Move over Bob Mayer and Dan Brown there's a new kid in town!" 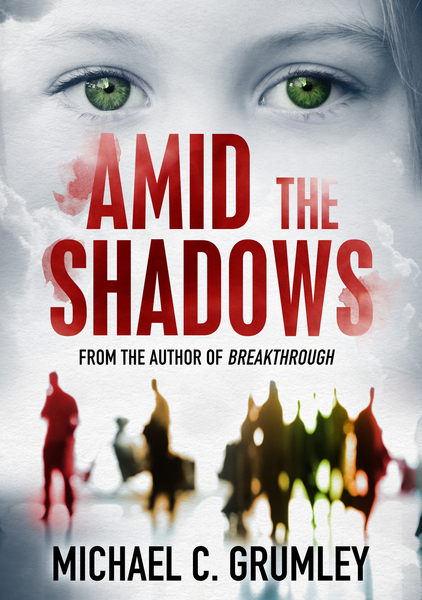 "Another winner from Michael Grumley"
Thank you for reading Amid the Shadows. This FAQ page is a small supplemental to the book, and answers common questions by readers. Please note that this page contains SPOILERS to the book, so if you have not read AMID THE SHADOWS, please do so before continuing. Q: Will there be a sequel to Amid the Shadows? A: Absolutely. There are three other books planned in the Shadows story line, including a prequel following Jonathan Avery. Q: What happened to the police officers Daniel Griffin, Mike Buckley, and Cheryl Roberts? A: Unfortunately, all three officers died. They were all killed by Zahn. Q: How did Bazes escape the plane when he pushed Rand out? A: Bazes lived, but never actually “pushed” Rand out of the plane. Instead, he told him to “get out”. But Rand was not one to give up, and didn’t. He finally managed to free Bazes, and got them both out of the plane. Q: Is Rand going to train the new boy mentioned at the end of the story (as the next Lochem)? A: Yes. The previous Lochem trains the next when possible. And the next mission will be even harder. Q: Is there a relationship between Avery and Zahn? A: Yes. As mentioned above, the previous Lochem usually trains his successor. However, Zahn turned from his path before Avery was born, therefore breaking the chain. As a result Avery had to train himself. Note the number of years between each Lochem is shortening. This compression is related to what lies ahead.